Ok…so, I feel that I need to throw out a disclaimer first. I don’t usually….fry. Anything. In oil. However, over the years we’ve spent living gluten-free, we have discovered that there are just some things you can’t find a substitute for. A few foods that we used to enjoy, but can’t buy in a store or order at a restaurant. Or, more accurately, can’t buy in a store without taking out a loan and risking paying way too much for a product that’s mediocre at best. Recently we’ve noticed a hole in our lives. A hole that had been growing for seven long years. And it’s name was: Corn Dogs. You can buy frozen gluten-free corn dogs at the store, but you’ll be out over $10.00 for five corn dogs, which is a risk I’ve not been willing to take. But when a friend of mine shared a recipe for gluten free corn dogs with me, I decided it was time to fry! Hubby and I went to the gym first, in anticipation of the ridiculous number of calories we were about to consume. Seriously. And then I went crazy in the kitchen making some treats that we’ve missed for many years. Why is it that the cheapest and quickest foods are the hardest to duplicate gluten-free? As long as we were clogging arteries, I decided to make onion rings as well. Onion rings are another food you just never get gluten-free, in fact I don’t think I’ve ever seen them in a store or restaurant. My reasoning was, the oil was there, the batter was there, and I am unlikely to fry anything again for who-knows how long. The whole experiment was a raging success…not only did the corn dogs and onion rings taste like the “real” thing, they were so far superior to the frozen type we used to get pre-Celiac that even the gluten-eating members of the family were thrilled. These corn dogs tasted more like type you can buy at a food court in the mall, from a teenager wearing a ridiculous multi-colored hat. 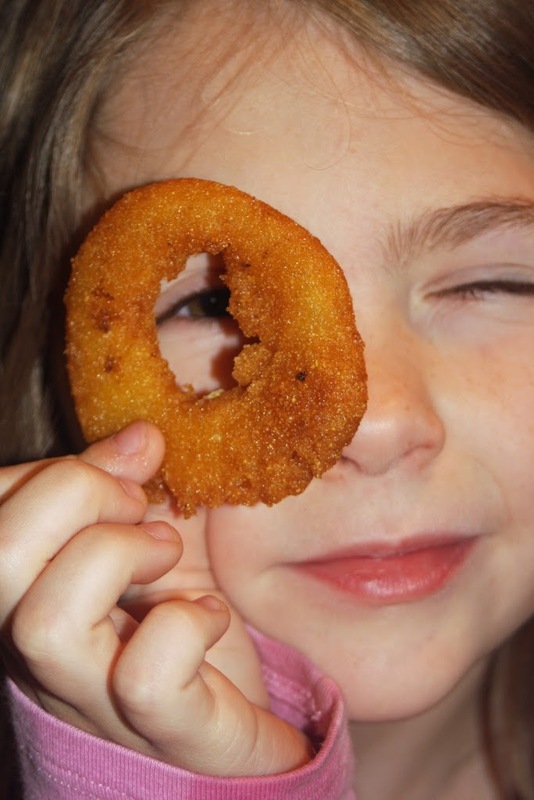 And the onion rings…oh, bliss! I had forgotten how good bad food can taste. You’ll find me back at the gym tonight, but it was well worth it. For one sweet dinner, we were in Corn Dog heaven. The recipe I used (adapted from this one at Allrecipes.com) is doubled, and will make you a LOT of corn dogs and a LOT of onion rings. We put the left overs (enough for dinner for all 3 kids, at least) on a cookie sheet and froze them individually, then put them in zip lock bags to throw in the oven for a quick dinner some time in the future. We also decided to forgo the sticks and cut the hot dogs in thirds, next time I make these I’ll probably buy some wood craft sticks and make them the traditional way just for fun…but the smaller version turned out really good. If you are not on a gluten free diet, just substitute the gluten-free flour for regular wheat flour. Here’s the recipe and a photo-tutorial. Enjoy! 1 very large onion, cut into rings. Cut the chicken franks into thirds. Boil them for a few minutes until they are nice and fat. This will make sure that they are juicy and that the frank part of the corn dog is hot, without over-cooking the crispy exterior. Let the cooked franks dry in a strainer while you prepare the batter (the batter will stick better to dry franks). Mix up the dry ingredients in a deep bowl. We had fun with the baking powder, as you can see! Add the wet ingredients and mix well. Using a skewer, dip the frankfurters into the batter (or, if you’re using sticks, poke the stick into the frank and use that to dip it). Using a second skewer, slide the corn dog into the hot oil (I had the oil on medium heat on my stove top). Cook for several minutes on one side, then turn and cook on the other…corn dogs are ready when they are lightly browned on both sides. The batter will puff up considerably, so don’t worry if it looks a little thin to begin with. Place the cooked corn dogs on a plate lined with paper towels and set in a warm oven while you cook the rest of the corn dogs and onion rings. For the onion rings, repeat the process above, dipping each ring of onion in the batter and frying until the rings are browned on both sides. Remove the finished rings to a paper-towel lined plate. Enjoy your super-fried meal! You’ll be surprised at how both the Corn Dogs and the Onion Rings taste just like the ones you remember. So good, and so bad for you….but hey, you only live once, right? oh… thank you for the onion ring recipe. they are a comfort food and I missed them. oops, just got a little drool on the screen.